image: 9999 archive. S-space event at Space Electronic, Florence, 1971. More open lectures to come. Please share this page with friends and colleagues! As a point of departure for the new independent course Organising Discourse this double lecture will present and discuss discursive space emerging from within the disciplines of design, crafts and architecture, at the same time resulting in self organisation and institutional activities such as exhibitions. Drawing a line from history to the present, Peter Lang brings his examples from the 1960’s and 70’ Italian radical movement whilst Ana Džokić and Marc Neelen will present samples from their diverse and interdisciplinary practice of today. 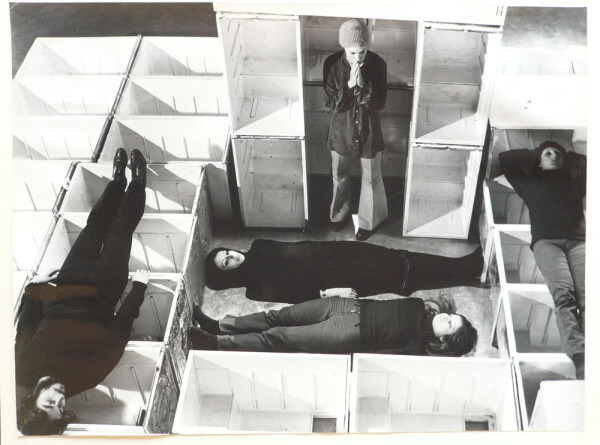 Outer-limits: experimental collectives, groups, movements in post-war Italy. A number of cutting edge art and design collectives were established in post-war Italy, notable for their diverse practices and far reaching visions. These ensembles produced an extraordinary range of work, reaching broad international audiences, while setting new benchmarks for intellectual rigor and social conscientious. Yet group work is at best controversial, frequently debilitating and often of short duration. Gruppo 63, gruppo 70, gruppo N, the international New Tendency, gruppo T, Superstudio, gruppo Strum, 9999, Global Tools, operated on the fringes of the traditional exhibition circuits, gallery venues, literary circles, publishing houses, and in the case of design, industrial production. The kinds of experimental processes developed within these collectives entered instead different arenas of exposure, collective exhibitions or non-profit galleries, alternative magazines and underground festivals. The work of these collectives also filtered through the larger exhibition venues, like the Trigon in Graz, the Milan Triennale, the Venice Biennale, the Palazzo degli Esposizioni in Rome, or via exceptional events, like the Contemporanea, held in 1973 in the newly finished Morretti garage under the Villa Borghese. While these multi-disciplinary collectives were largely held together by political ideology and common social concerns, the tangential way these movements operated largely hindered their long-term diffusion and success. Just what would it take today to operate using similar strategies and programs today is a question that remains extremely relevant, as similar kinds of network and social media communities are becoming increasingly active in the creative public domain. Oscillating between fields like urban research, spatial interventions and cultural activism, a line of activities has emerged over a number of years, meanwhile manifesting itself as the practice STEALTH.unlimited. When asked to describe the inner logic of this trajectory, with a slight feeling of awkwardness we admit that managing to keep on track the discourse of shared authoring of space, while navigating through various projects, takes us at times by surprise. In any case, moving in this way from project to project has enabled a practice that sets its subsequent subject of focus slightly off-track, and thus opens the horizon for other, less expected possibilities or opportunities to tackle the larger social relevance of architecture today. With this talk we will take a look at a set of involvements, like co-curating activities at the Venice Architectural Biennial in 2008 with ARCHIPHOENIX: Faculties for Architecture (a platform occupying the Dutch pavilion to focus on the capacities and capabilities of architecture – beyond building), a yearlong involvement with Cittadellarte / Fondazione Pistoletto in Biella (on artistic and cultural initiatives and institutions changing key aspects of urban life) and the platform Who Builds the City we co-initiated in Belgrade in 2010. We will speak about our submersion into particular institutional contexts, our exchange with and resurge from them, in order to fold these contexts inside-out and subvert them to become productive in terms of common knowledge, awareness, and approach. PETER LANG is professor in Architecture History and Theory at the Royal Institute of Art, in the Department of Architecture, Stockholm (Kungl. Konsthögskolans, Mejan Arc). He holds a Bachelor in Architecture from Syracuse University (1980) and a Ph.D. in history and urban studies from NYU (2000). From the Fall of 2001 to the Spring of 2009 he served as permanent Texas A&M faculty at the Santa Chiara Center in Tuscany Italy. In 2009 he was appointed Associate Professor at Texas A&M in College Station Texas where he has taught graduate courses and directed PhD students. Peter Lang writes on the history and theory of post-war Italian architecture, with a focus on sixties Italian experimental design, media and environments. Together with Luca Molinari and Mark Wasiuta, Peter Lang has co-curated the exhibition. Environments and Counter Environments: Italy: The New Domestic Landscape, MoMA 1972 on view at the Graham Foundation Chicago from September 18, 2013. Peter Lang is also actively involved in urban field research. STEALTH.unlimited is a practice operating between Belgrade and Rotterdam, set up in 2000 by Ana Džokić and Marc Neelen. Through intensive collaboration with individuals, organisations and institutions, STEALTH broadens the understanding of what architectural and urbanistic engagement can be today. Following their curatorial engagement in Venice (2008), in 2009 they curated the Tirana International Contemporary Art Biennial, in 2010, and IMPAKT festival in Utrecht under the title Matrix City. In 2011 they were curators of the fiction-based exhibition project Once Upon a Futuremagn, for Bordeaux’s biannual Evento. In 2008 with Marjetica Potrč STEALTH completed a schoolyard in Knivsta, Sweden, based on the principles of sustainable energy, in 2011 in Gothenburg initiated a spatial intervention of the local community at Röda Sten and with El Puente_lab built a cultural development node out of recycled materials in a slum neighbourhood of Medellin, Colombia. STEALTH are currently undertaking research at the Royal Institute of Art (KKH) in Stockholm. ORGANISING DISCOURSE is an independent postgraduate course at Konstfack, exploring and developing platforms for discourse within the crafts, design and architecture. It aims to support and invigorate the development of new conceptual and physical spaces for presentation and display, meetings, discussions and debate, research and modes of production, etc. Within the crafts, design and architecture, it focuses on experimental, investigative and critical practices.